Brown the meat, onions, and peppers, add the spices and tomatoes, let it simmer for about 2 hours. For dinner, I made cornbread and we put the chili on the cornbread and topped it with shredded cheese. It was not nearly as spicy as one would expect for putting an entire jar of chili powder in it (basically 1 CUP of powder). But it was tasty! 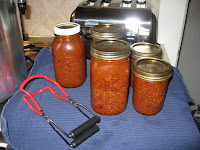 After dinner I filled up 4 quart jars and 2 pints and the pressure canner is going. 90 minutes at 10 lbs. of pressure, based upon the cookbook's recommendation. Why are there only 3 quarts, you ask? To bland even with the jalapenos. Try adding some garlic and cumin and a little paprika and black pepper. I also up-ed the amounts to make a whole canner load of 7 qts + a second load if I have time to let the first load cool down to process the second. My amounts would be good if I were to have dinner as well as a canning load. I was thinking of doing some pints for chili dogs. Thanks for the guidance it was a good basic recipe to start with.